Saving the world is hard enough, but what about the tests of inner strength faced by today's harried superhero? Unafraid to tackle the tough questions, Does This Cape Make Me Look Fat? 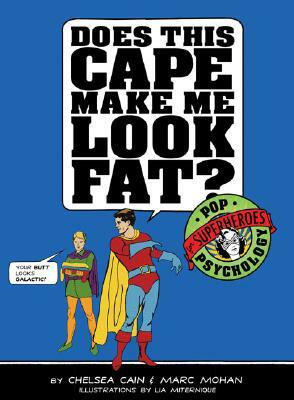 offers illustrated self-help guidance for the caped crusader on the subjects of costume choice and self-esteem, guilt and x-ray vision, getting along with a sidekick, thriving in the team environment, negotiating a secret identity at work, and more. The action-packed, comic book-style illustrated advice will help heroes conquer fear of flying, get in touch with super feelings, and choose the nemesis that's right for them. Also including practical advice for avoiding lawsuits, coming up with a good catch-phrase, and maintaining super hair, this hilarious self-help manualand sly pop psychology satirebrings the help heroes need right to their gloved fingertips. Chelsea Cain and Marc Mohan use their super powers to protect and serve the greater Portland, Oregon, metropolitan area. Lia Miternique's illustrations leap tall buildings in a single bound. She lives in Portland, Oregon.